Privacy at it's Finest! 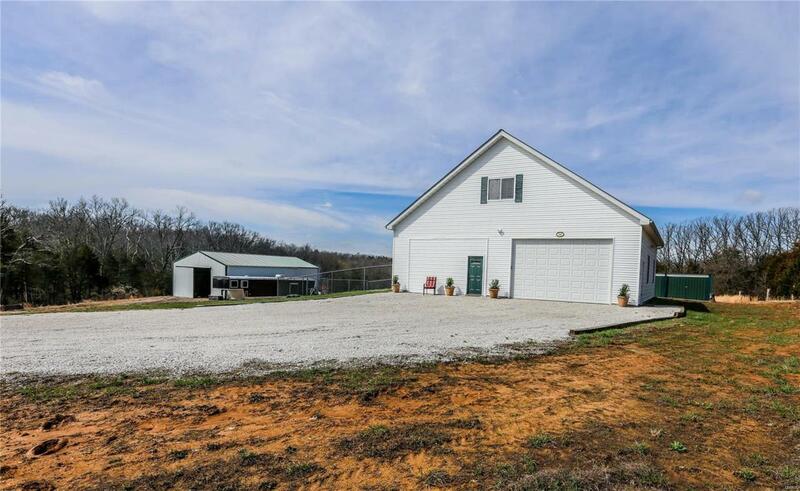 15.7 Acres of Level Tree Lined Pasture. 44x40 Shome "Shop Style Home" The Main Level of the Home offers a Spacious and Open Floor Plan with a Large Open Space for the Family Room, Kitchen and Dining. You Will Also Find a Large Laundry/Utility Room with additional Shelving for Storage and a Full Bathroom. The Second Floor offers a Large Master Bedroom, Possible Second Bedroom or Massive Walk-in Closet (Located Between the Master Bedroom and the Second Floor Full Bathroom) and a Home Office Area. There is a Deck located off the Second Floor that offers a Dramatic View of the Property. The Exterior of the Property offers an Attached 22x40 Garage/Shop, 30x56 Detached Garage,& Nice Sized Wood Shed. The Perimeter of the Property is Fenced, and Cedar Posts are in Place to Divide the Pasture from the Home. You will also Find a Small pond and Beautiful Wet Weather Creek on the Property. This is a True Must see and Won't Last Long.